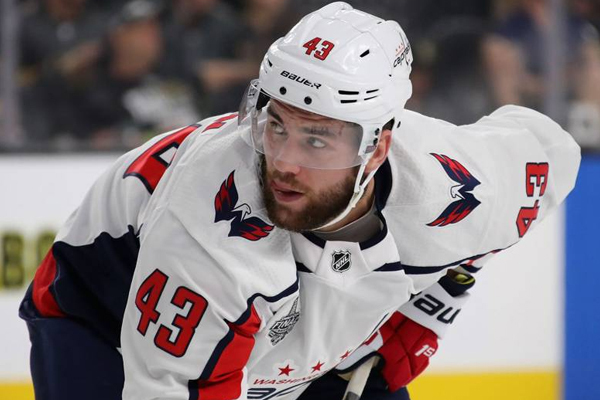 Tom Wilson of the Washington Capitals was suspended 20 games for an illegal check to the head of St. Louis Blues forward Oskar Sundqvist, but according to the NHL his suspension has been reduced to 14 games by a third-party arbitrator. “The National Hockey League Players’ Association and National Hockey League announced today that Washington Capitals forward Tom Wilson’s 20‑game suspension for an illegal check to the head of St. Louis Blues forward Oskar Sundqvist has been reduced by Arbitrator Shyam Das to 14 games. Wilson had already served 16 games so he is now eligible to play. The reduced suspension saves him $378,048.78 in lost salary. Wilson’s original suspension was handed out following a brutal hit on Sunqvist during a pre-season game. Sundqvist left the game bloodied and did not return and Wilson was ejected after being assessed a 10-minute penalty. He appealed the ruling, but commissioner Bettman upheld it as he is considered a repeat offender after being banned three times for hard hits last season. Wilson could be back on Tuesday to face off against the Minnesota Wild.